Een Komodo varaan woont op een eiland in de Indische Oceaan dat bij Indonesië hoort. Ze hebben niet echt schubben of zien er uit als een fantasie draak. Het is echter wel een heel uniek dier. Ik vind het een prachtig dier om te zien, je kunt hem zelf bekijken in het Reptielen huis van Artis. 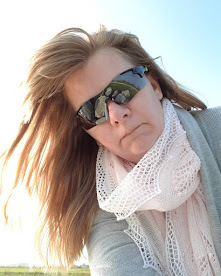 De vormpjes in deze shawl vond ik wel wat op 'schubben' lijken. The Komodo 'dragon' is living on an island in the Indian Ocean, part of Indonesia. They don't really have a scaled skin or are like a fantasy dragon in real life. They are pretty unique though. I really like their 'look'. I've seen one (small) for real at the Zoo Artis in Amsterdam this Fall. De patronen kunnen worden geaccentueerd met kraaltjes. In het engelse garen van Posh Yarn heb ik gele kraaltjes gebruikt. The patterns in this design can be accentuated by small glass beads. In this case yellow to go with the Posh Yarn. (this colour is no longer available, but she has plenty to go around)..
Het rode garen is heerlijk zachte lamswol, gewoon uit Nederland. Verkrijgbaar in vele kleuren maar in het rood toch wel erg mooi. 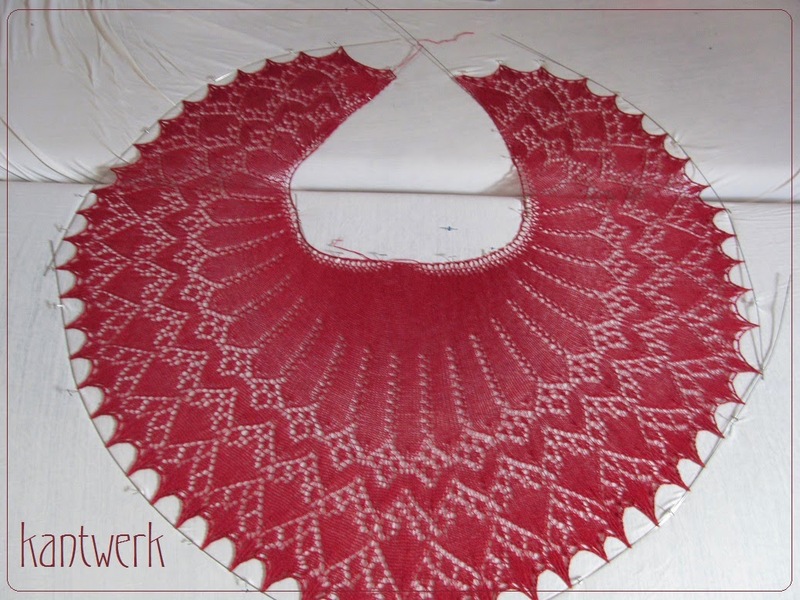 Door de vorm van de shawl blijft hij goed zitten wanneer je hem draagt. Wel opletten, de binnen rand is een tikkie kwetsbaar. The red yarn is wonderful soft lambswool from the Netherlands. Available in plenty of gorgeous colours, but very pretty in red. The shape of the design makes it very versatile to wear and it will stay put very easy. Please take note that the inner edging is a bit fragile. In instructie 3 staat dat je de chart 2 drie keer moet herhalen. Dat klopt. Maar niet rij 48-83 drie keer herhalen. Dan heb je 258 steken, en niet 262 of 274. Het spijt me als dit tot vertraging of problemen heeft geleid. Let's face it. 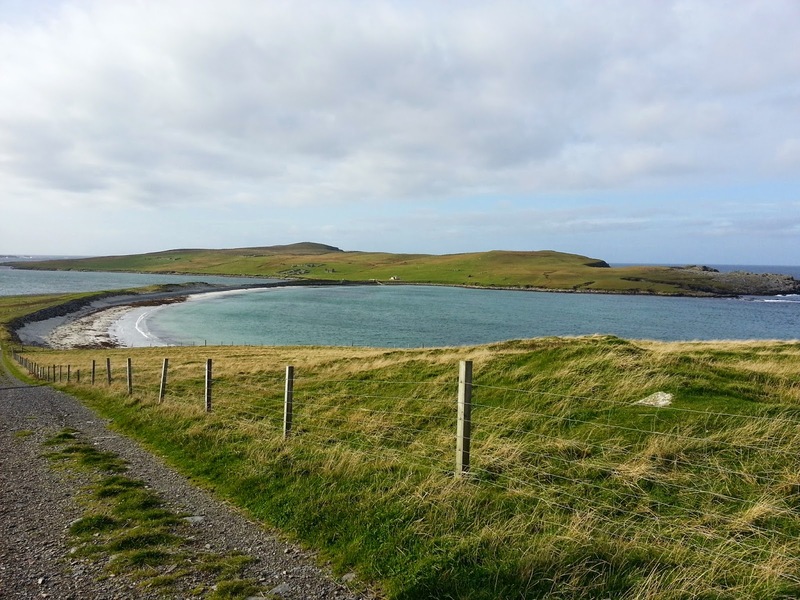 Shetland is more than just WoolWeek. 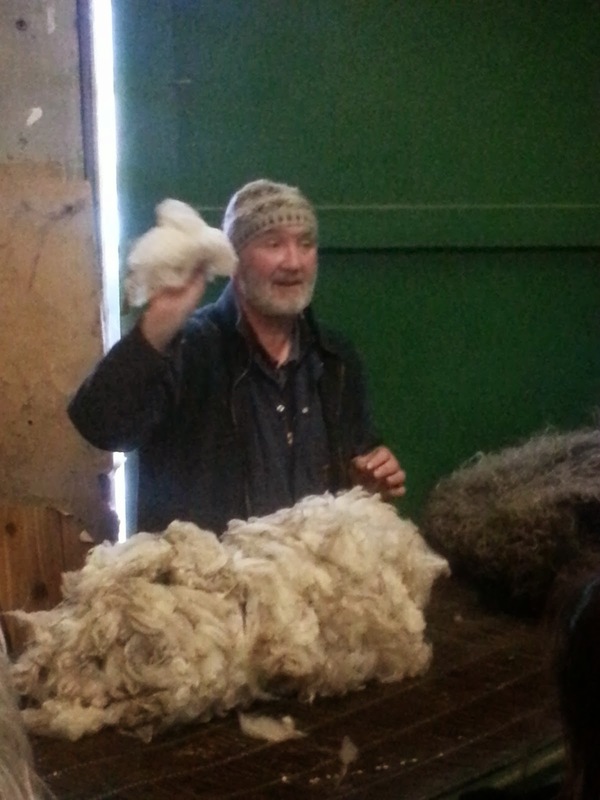 How much I thoroughly enjoy the talks and workshops about wool, techniques and spinning, knitting etc., I was struck by the beauty of this islands the second I set foot on it, 2 years ago. And it was sunny weather and a great walk. In 2012 there was Hermaness at our feet. 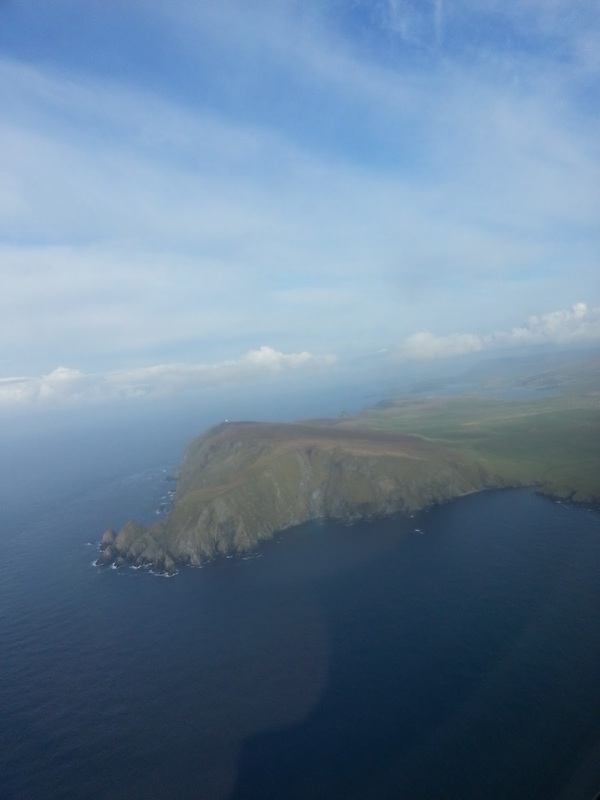 Not this time, we spent time at Norwick (Unst). A short walk on a long beach. I stood on a rock but the waves were quick and I got my feet wet. The day before I had chosen to talk a walk on the 'red' island. I had looked on my little map to find a place I hadn't been before. And somewhere I could walk and be back in time for the next workshop. Muckle Roe. Just take a left at Brae and you'll have to hold on to your seat! It doesn't 'look' special but it sure was. Wikipedia told me there was a small bridge (there was) and that the island has red rocks. It does. I didn't see that anywhere before. It was a bit more rugged than other parts I've walked. After I had reached the end of the road, parked the car and started walking into the fields, I noticed a sign. Hé, I can walk 2km and back ánd be back in time for a workshop in Lerwick. Little foot holds to make sure the sheep don't escape.. hahaha. No path. So, decided to walk up to the beach. This was amazing! Not a soul in sight. Just cute little bunnies. Nature can be cruel, though. I saw their little white tails hopping. Had I been a hunter, I could have shot them. Luckily for them, I'm not. Now... Where is the 'path' to the lighthouse? Found a path, and kept on walking. Enjoying the view. It was so quiet. Just as quiet as I had experienced on Sandness 2 years ago..
On the blog by Jan, I had noticed a pile of rocks. I had found 'my own'!! Searched for a nice stone to add to this 'memorial'. And one more hill to climb. Had to use the 'riverbed' for lack of other ways to get up the hill. The views kept getting better. Although I did start wondering when the darn lighthouse was going to appear. And finally... There it was. You see that little white boxy thingy? That's it. I think the expression on my face says it all. The walk was great, but I had expected a bit more... well... like this. 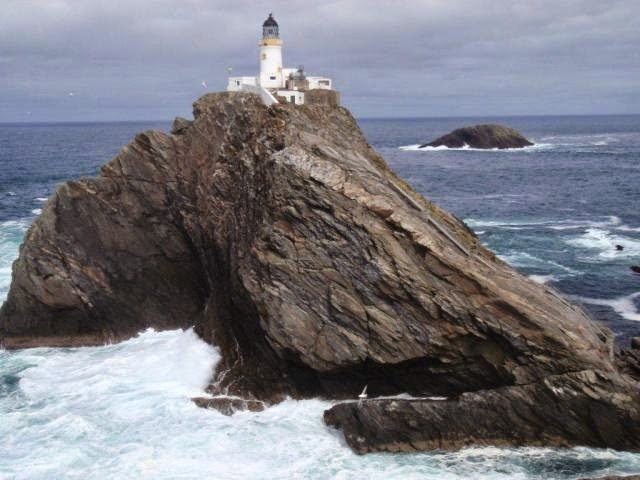 Muckle Flugga... (Picture by Andy Strangeway). Because I didn't get to it in 2012, I thought that maybe, perhaps, somehow, with a similar name, came a similar lighthouse. Nope. Oh well. It was a great time spent on my birthday. I did manage to phone my husband, even at that remote location. And got back in time for the workshop. Opening Ceremony on Sunday. It was so heart warming to meet a lot of people again or for the first time. You see me (right) here with Ina Irving (left). I was VERY proud to meet her. 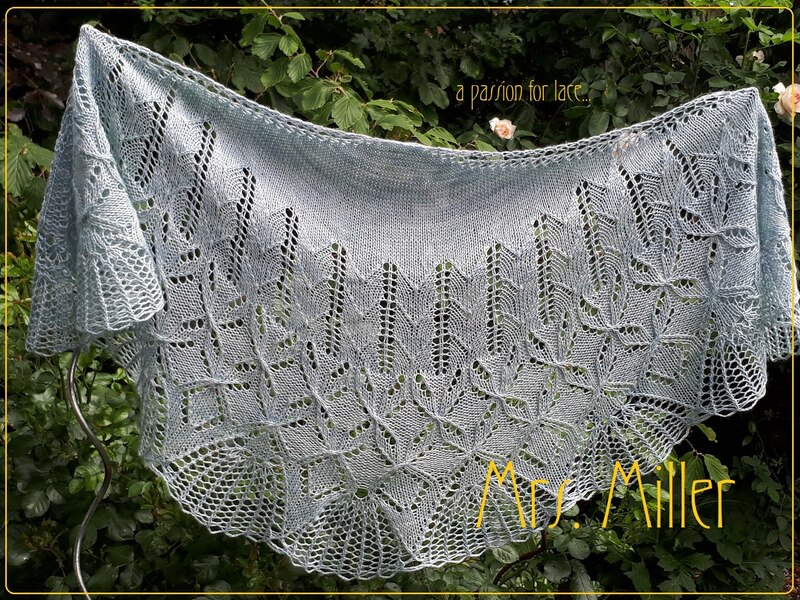 I had seen her lace on Ravelry and was very impressed. I could see her lace work up close, the colours, the details. All very inspirational. 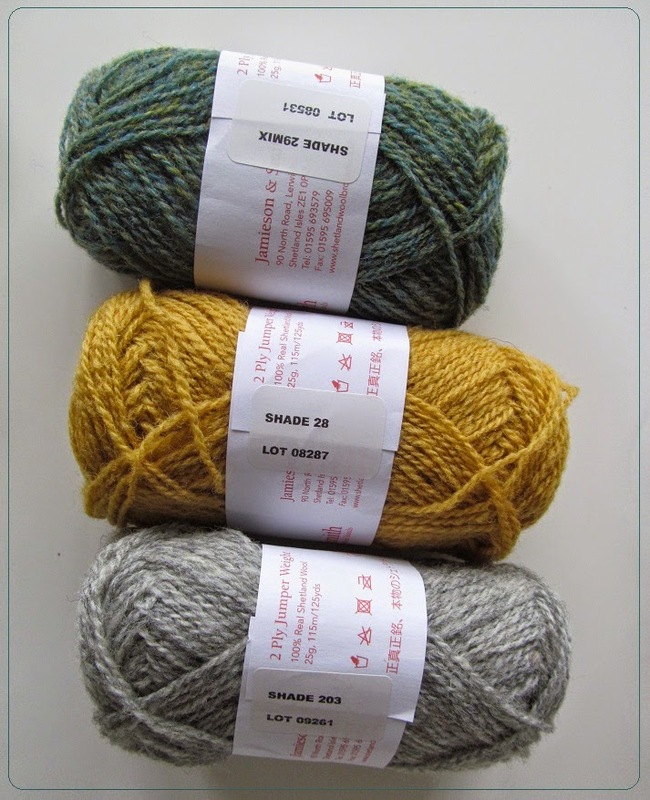 So very much so, that I even frogged a project and started over, the shetland way. Small needles and fine lace yarn. 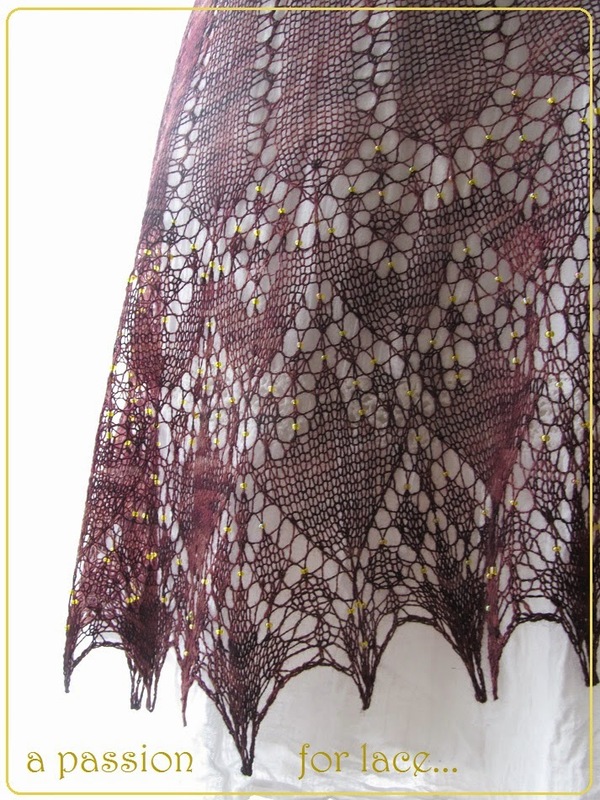 (I'm wearing my The 12th of Never shawl in fine silk lace). This is Linda (left) , Ina's daughter. She's a great knitter too, her work is mainly Fair Isle. 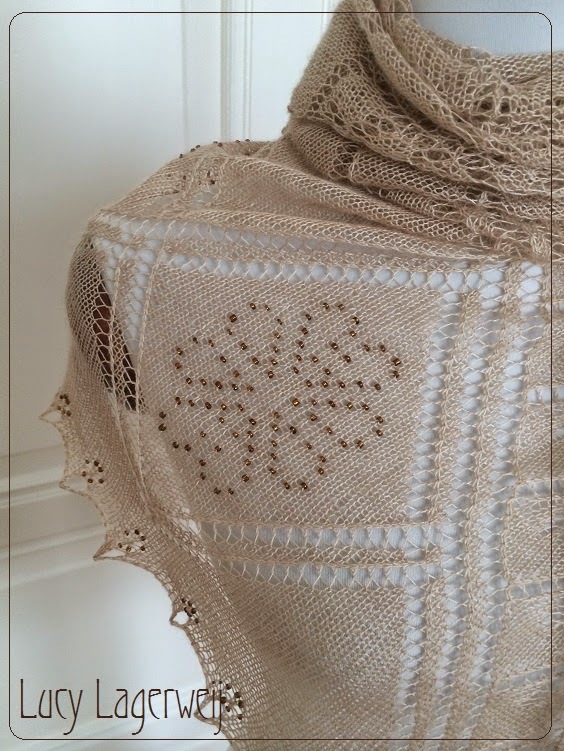 Amazing projects and love the delicate patterns. 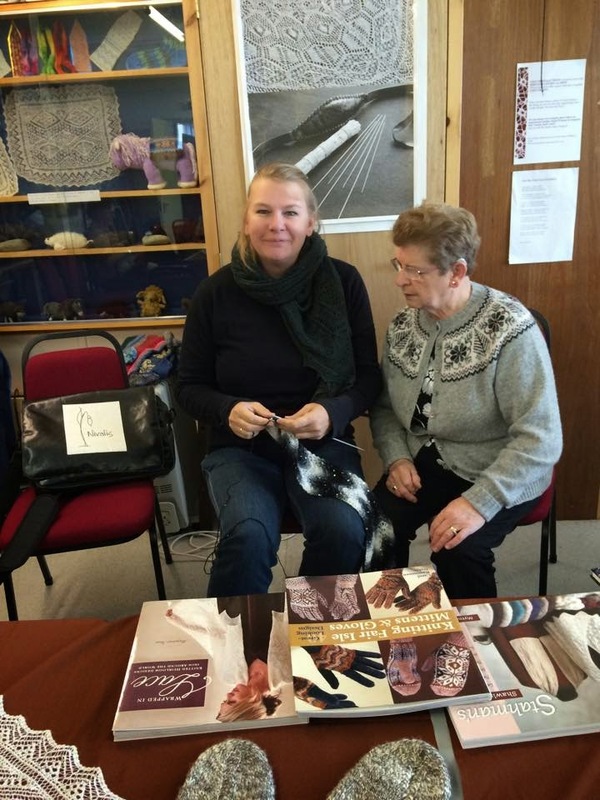 Later, I met Linda at the Bod of Gremista, where she was with the girls from the Whalsay, knitting away during Wool Week (and during lunch time at school!). (Holding my shawl The One). The girls had learned how to knit and they even made their own sweaters! 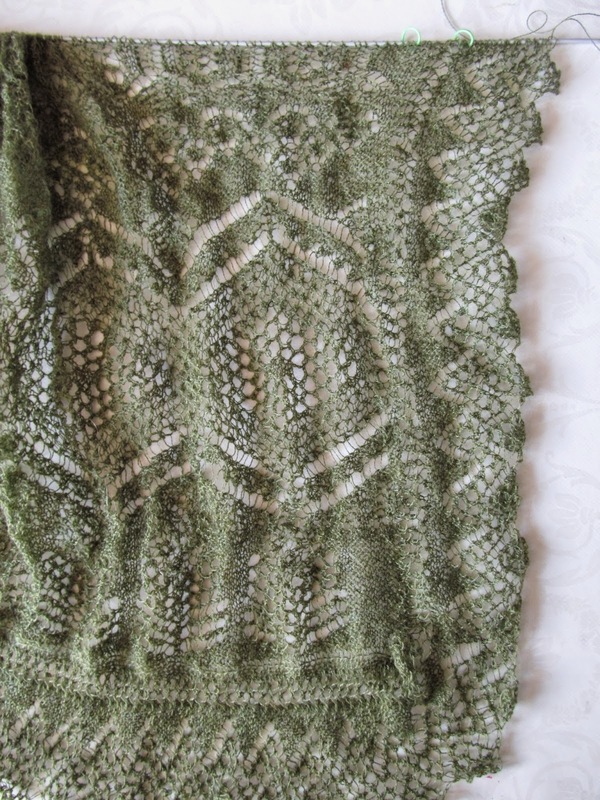 In the other room of the Bod: Fine handspun and handknitted lace. 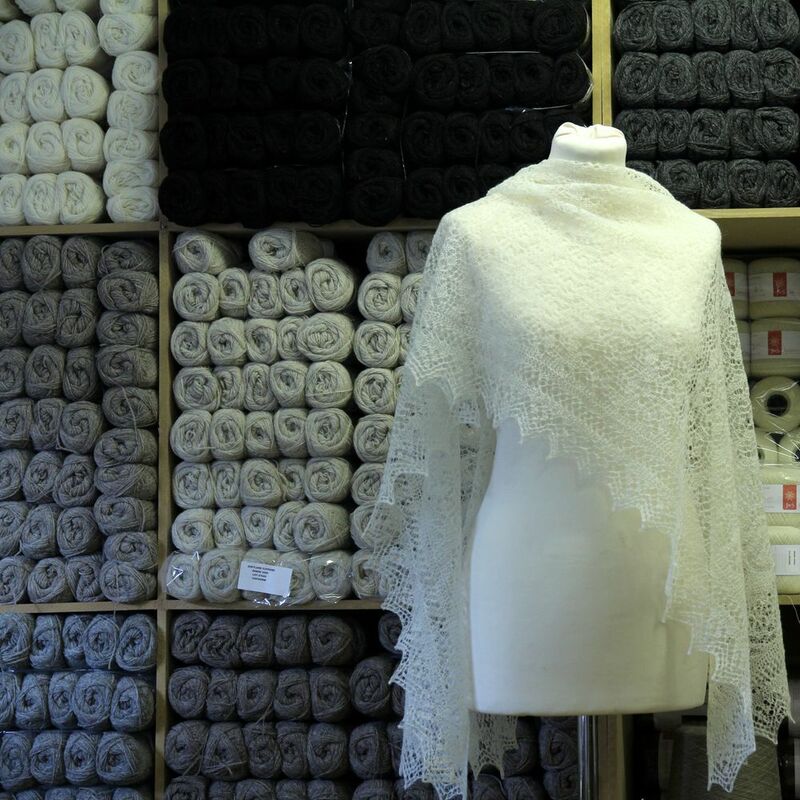 Three gorgeous white handspun shawls. One is made (not in this picture) by Anne, the lady of the Knitted Fence in Hamnavoe. 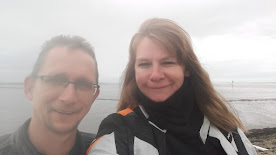 On Thursday me and Marieke went off to Unst. For me, almost the purpose of the whole trip. See how happy I am! 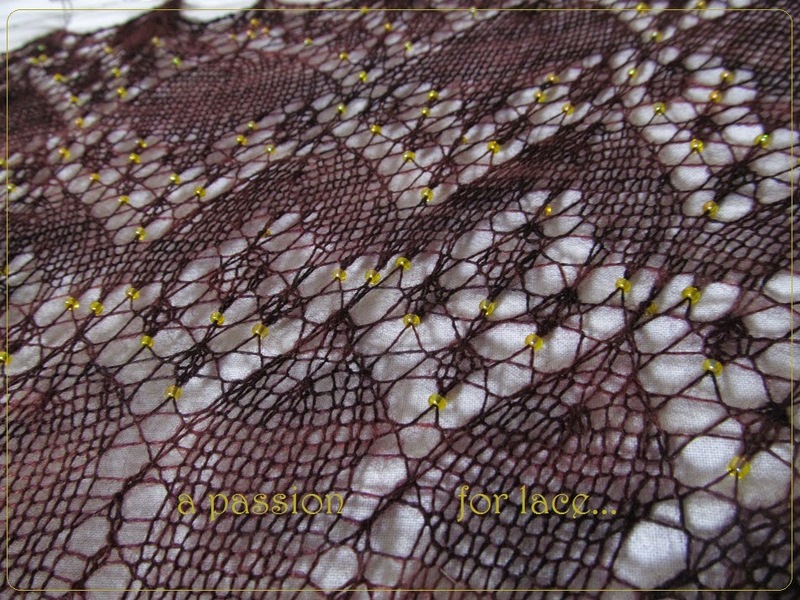 Talking about and looking at very fine lace! 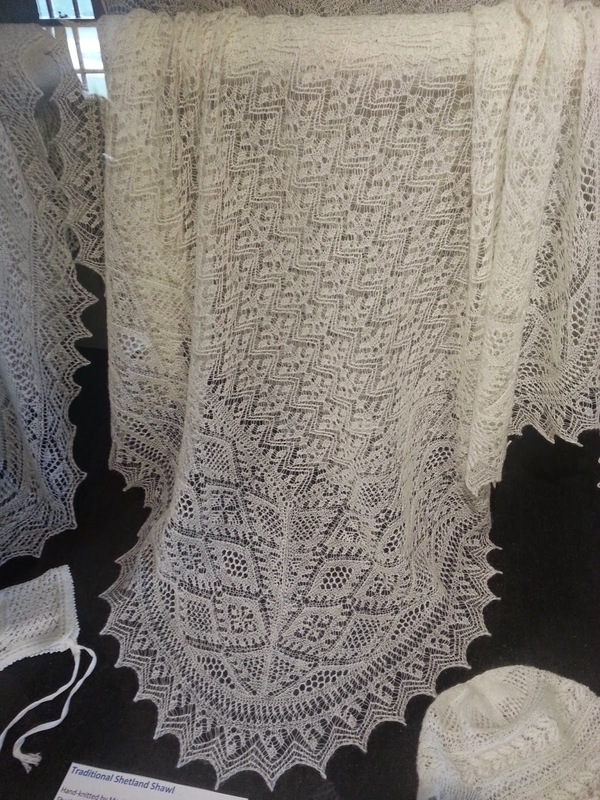 My shawls in white and light green were allowed to be on 'show' with the work of local knitters. Rhoda is presenting the new book made in Unst. She's wearing a handknitted lace skirt in 2 colours. 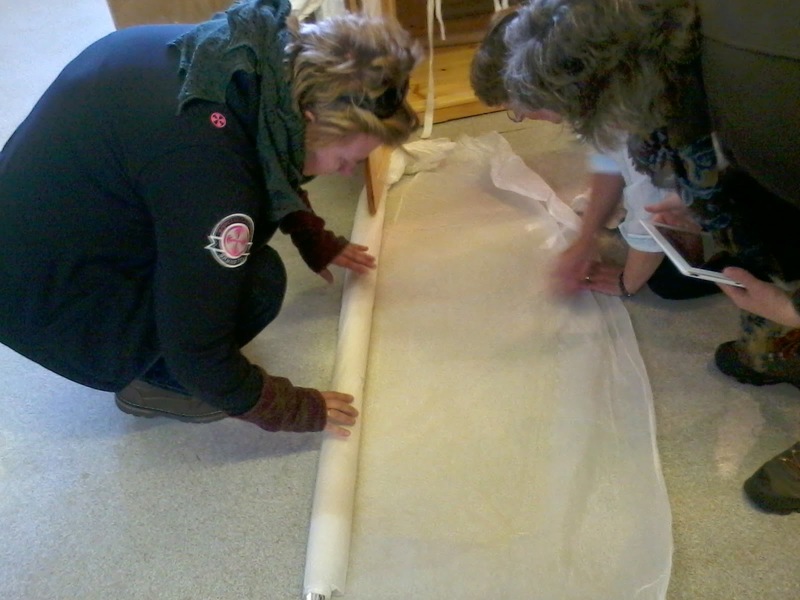 At Unst was the presentation of the little booklet with all new patterns. They were very kind and helpfull. I was allowed, after I had asked, to show the lace I brought. The 12th of Never raised a few eyebrows, what kind of pattern was that?? 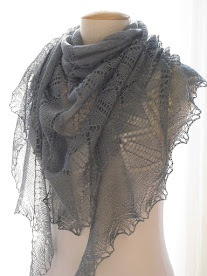 It's a shetland mesh pattern in a semi circular shape. 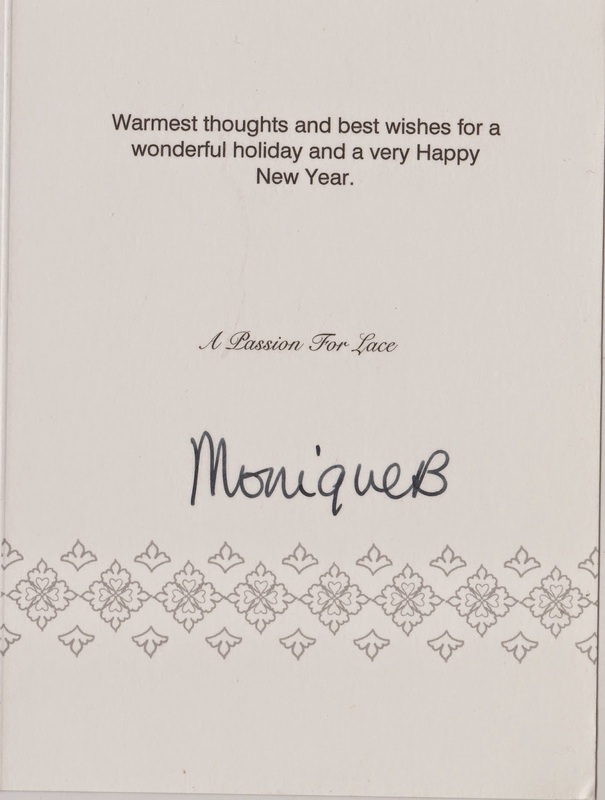 I had a great time, talking lace with Hazel Laurelson. She's so skilled. 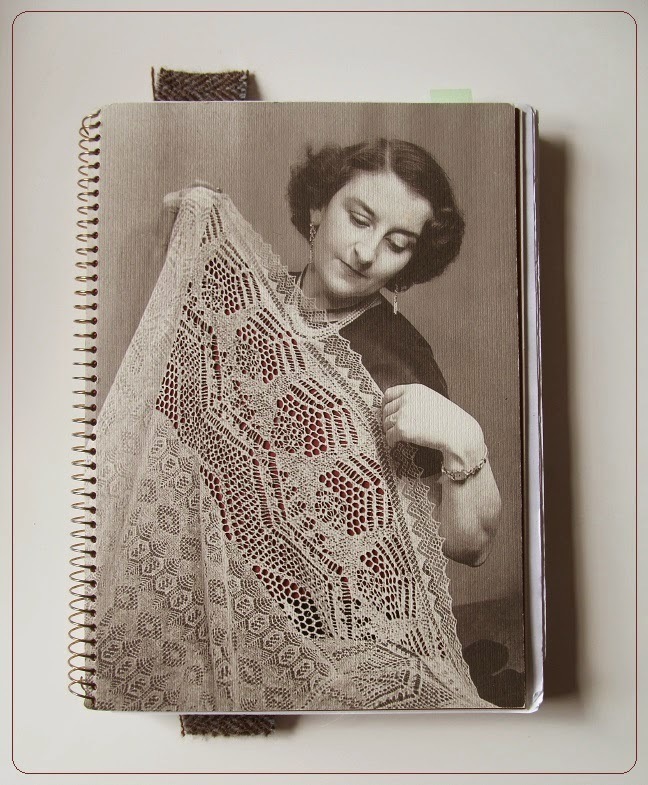 Two years ago I had purchased a book at the Museum and Archives (empty pages) with a lady on the cover holding a shawl. 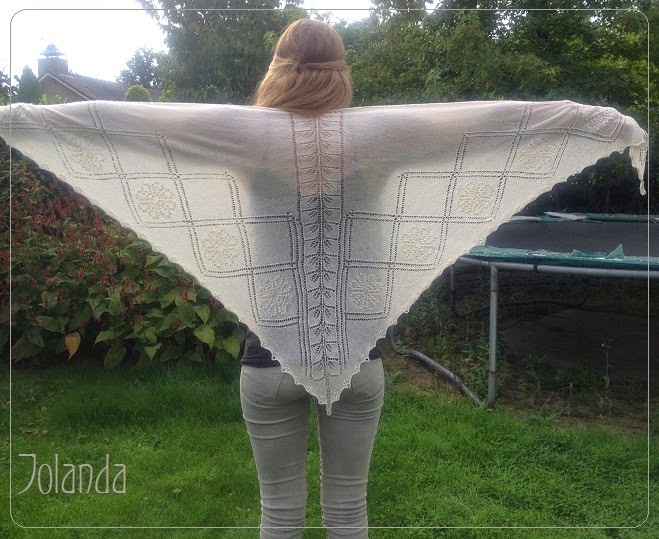 I bought it on purpose because I was actually knítting that shawl! 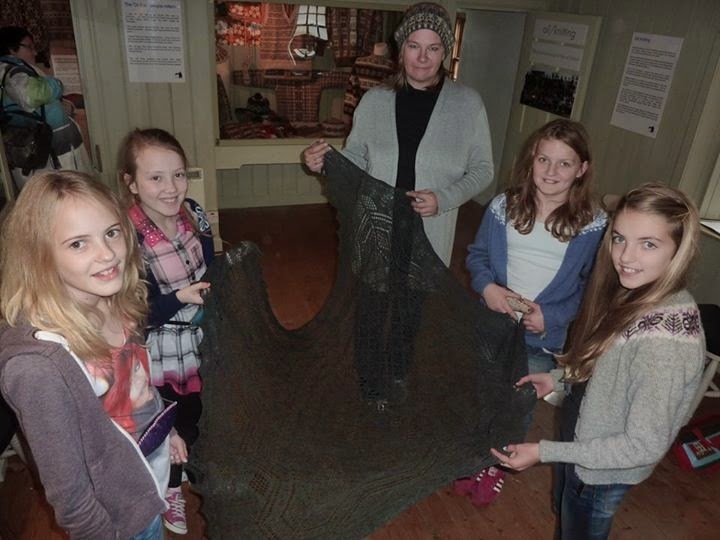 (Williamson Stole) The funny thing was, the ladies at the Unst Heritage Museum didn't even know, they had it on display thís WoolWeek! I wasn't allowed to take pictures, so no comparison to prove it. 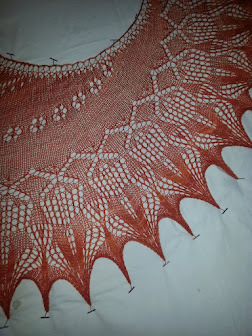 On Wednesday I was having a class by Elizabeth Johnston: Understanding Shetland Lace. To be honest, I shouldn't have. She didn't bring any examples, or had written instructions. Only a piece of paper to write your own pattern and work that. No casting on, binding off tips or things I give a lace class. She knows so much, though. Perhaps for other students it would be handy to have it all on paper for later. 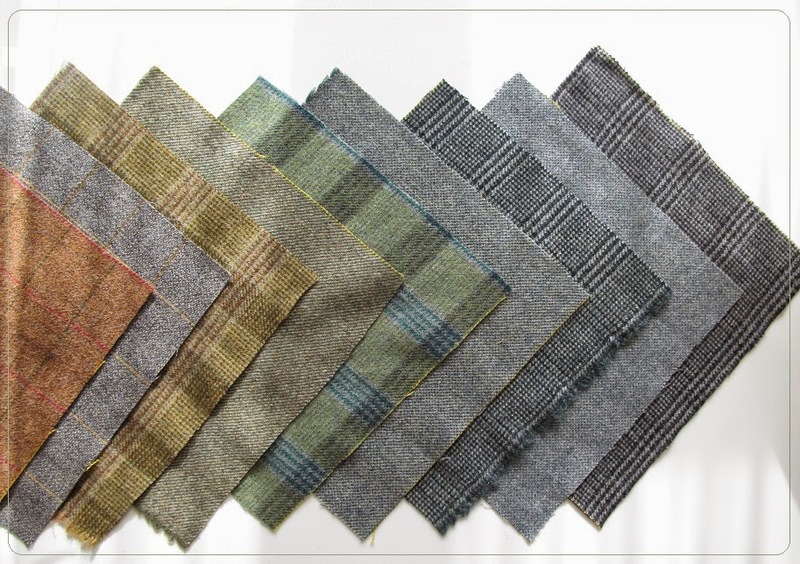 Wool Week gives many opportunities and information, it could be overwhelming. This is a knitted dress in the shop of Jamieson & Smith. 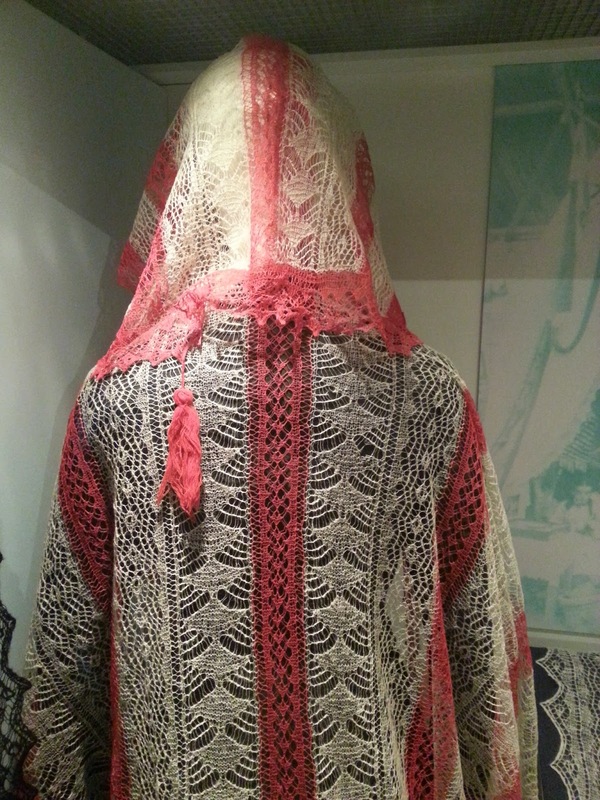 The body is worked in stockinette, very fine, and the lace capelet and veil are worked in a nice lace pattern. All in the latest addition to the 1ply fine lace range: Optical white. Finally, a visit to the Shetland Museum and Archives. Always a happy place to be at. 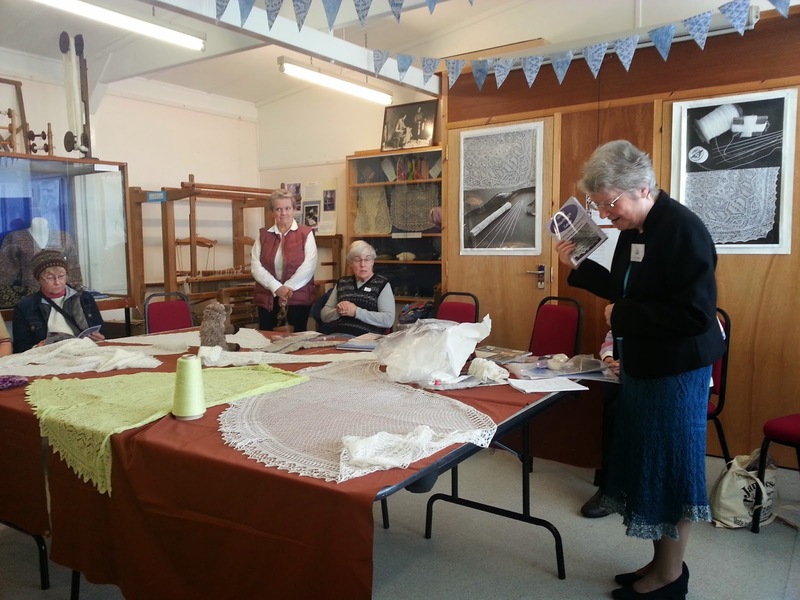 This year, the Hub was at the museum, so lots of WoolWeek people gathered for spinning, chatting, knitting, weaving and just to relax a bit. 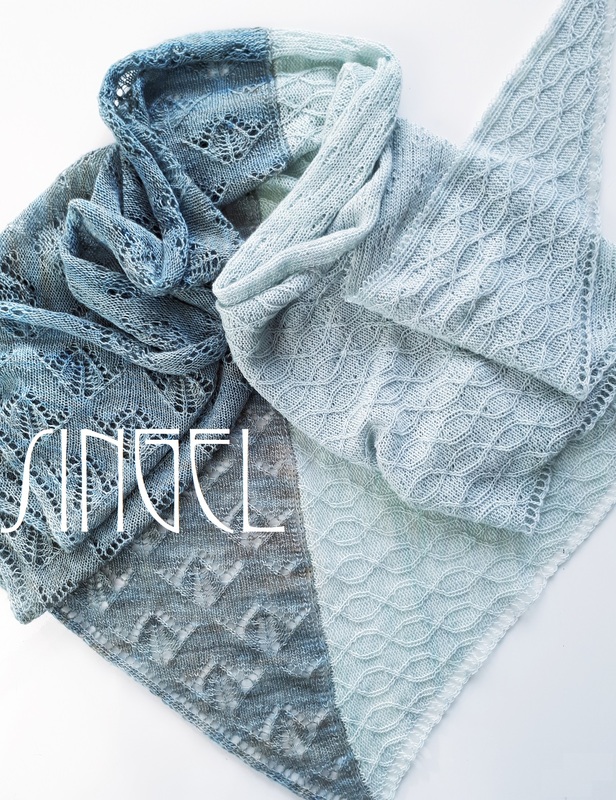 The most gorgeous fine lace shawls are on display. Even now, for the second time, I saw more things than 2 years ago. Even more impressed how fine it is, now that I know a tiny bit about spinning wool and knitting with it. At the end of the week, I had a little chat with Oliver Henry, Jamieson & Smith's wool sorter extraordinair. 45 years experience in woolgrading! I noticed that hardly anybody was WEARING lace. I did realize that it was Hazel Tindall's party this year, so it was logical that most people would bring their finest and most beautiful Fair Isle sweater, hat, cardi, dress, skirt or mittens. I get that. Every lace item I saw was 'On display'. Beyond glass windows or on a mannequin. WHY ISN'T ANYBODY WEARING ANY LACE??? The yarn is there, the patterns are there, but in every day life, I haven't seen anybody wearing it. 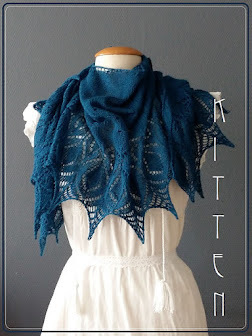 Look back at the pictures in this post; not even the teacher that's giving lace classes is wearing a lace shawl or scarf. Maybe people don't want to knit that fine yarn or use fine needles? Could it be that people think it's only for special occasions and too delicate to wear everyday?? 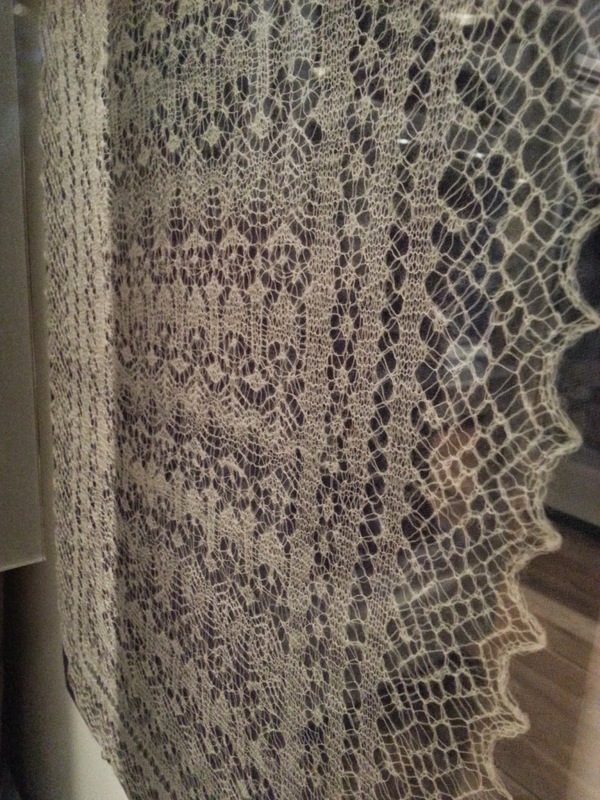 Lace is gorgeous on display, behind glass and to look at. BUT PLEASE: WEAR IT! WEAR IT PROUD. Máánden er naar uit gekeken en dan gaat zo'n week in eens toch wel heel snel. De komende dagen/weken zul je horen wat we ongeveer allemaal gedaan hebben; Anke, Marieke, Corry, Titia, Carla en Elsbeth en ik. Eerst maar eens wat mooie plaatjes. Tweed, 12"x12" (3x3 pakketjes gekocht). (Jamieson's of Shetland). Mónths of looking forward to it and then the week just comes and goed pretty quick. The next couple of days / weeks you'll be hearing all about the adventures we've had. Anke, Marieke, Corry, Titia, Carla en Elsbeth and me. First some pretty pictures. Deze WoolWeek zag de lancering van diverse boeken. Een uitgelezen moment om je patronen te publiceren. Bijzonder was het boekje van Gudrun. Ze is van Shetland, ze woont nu in Amerika en heeft prachtige truien en topjes ontworpen. Hele mooie kleuren, maar in amerikaans garen. Bij de 'book launch' heeft ze mij geadviseerd in het vervangen van de Brooklyn Tweed Loft naar Jamieson & Smith 2ply jumper weight. (Foto boven). Tijd voor een proeflapje want jawel; het patroon is er zélfs in mijn maat! This Wool Week is an excellent moment for a book launch! Timing is everything, lots of people to see your work right away (Trunk show at J&S store). Gudrun has made a second book with wonderful pictures at Belmont House (Unst) and one of the sweaters asked for my attention. At the store, she helped my replace the Brooklyn Tweed Loft with J&S 2ply jumper weight. The thing is, she even designed it in MY size!! Natuurlijk kon ik niet naar huis zonder kantgewicht garen van Jamieson & Smith. Er is namelijk een NIEUWE kleur: optical white. Echt witter dan wit. Tikkie lastig om te zien op mijn grijze naaldjes van Lana Grossa maar dan moet ik maar overdag meer gaan breien... Binnenkort ook HIER verkrijgbaar! Of course I couldn't leave without any laceweight yarn! Jamieson & Smith has quite the collection of 1 ply lace and even came up with a new colour: Optical white! 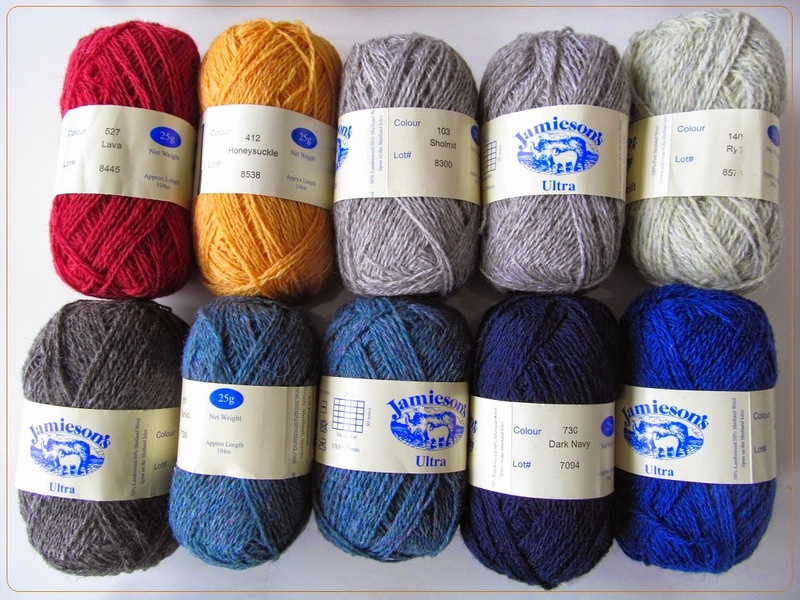 I have to knit this yarn by daytime, as it was a little bit hard to see on my grey needles from Lana Grossa..
Voor diverse projecten heb ik maar wat extra Jamieson Ultra gekocht. De twee midden blauwe bollen kregen we in onze goodiebag, met patroon, na de rondleiding in de Spinning Mill. Happy!!! For various projects I added some more Jamieson Ultra. 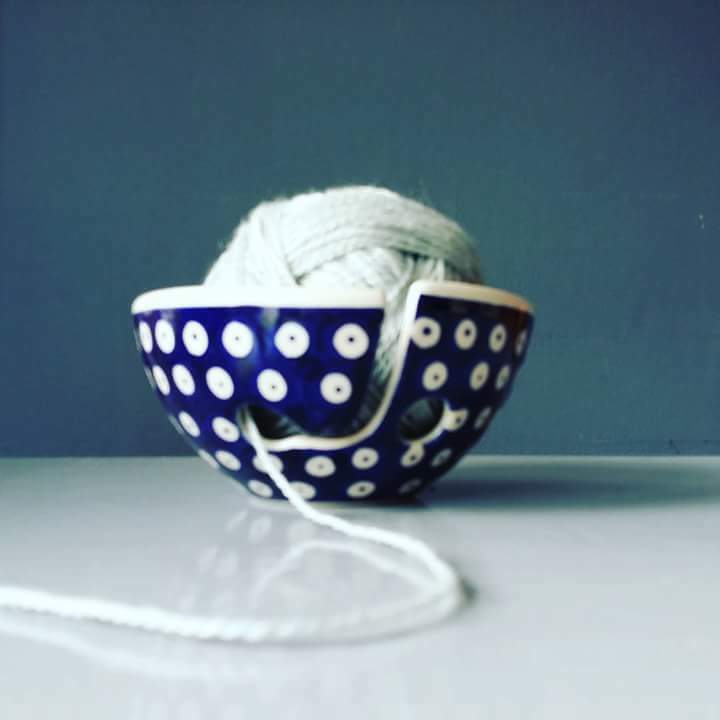 The two balls of middle blue came in the goodie bag we recieved after the tour of the Spinning Mill (pattern included!). 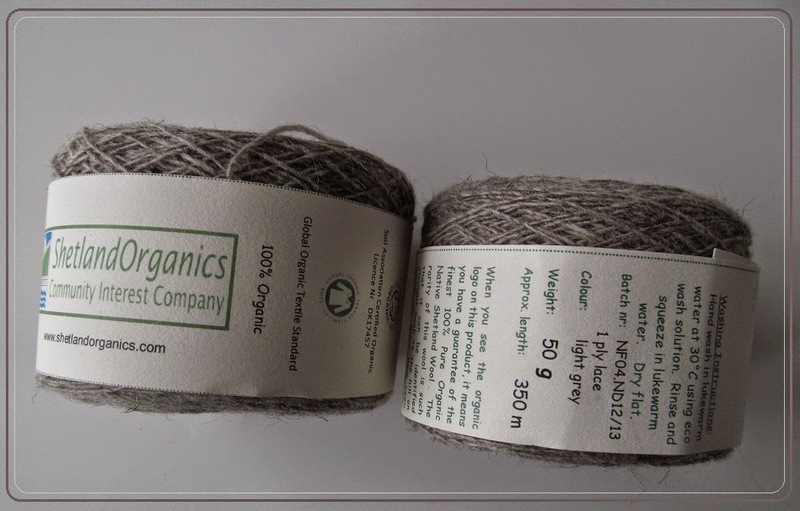 De vorige keer, in 2012, ben ik helemaal niet bij Shetland Organics geweest. Ammerins gelukkig wel, dus ik mocht deze keer niet overslaan. Een prachtig klassiek pand, houtsnij werk, mooie glazen deuren etc) met lekkere wolletjes. Aangezien ik nét spinles had gehad heb ik grijs garen gekocht en wit en 'zwart' om zelf te spinnen. Kijken of het lukt. 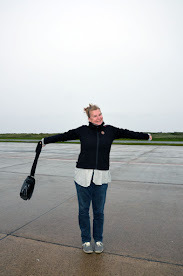 On my previous visit to Shetland, I never came around to visit Shetland Organics. My friend Ammerins did, so I didn't want to miss out on it this time. A véry pretty property with woodcarved panels, nice glass doors and lots of woolly goodies inside. 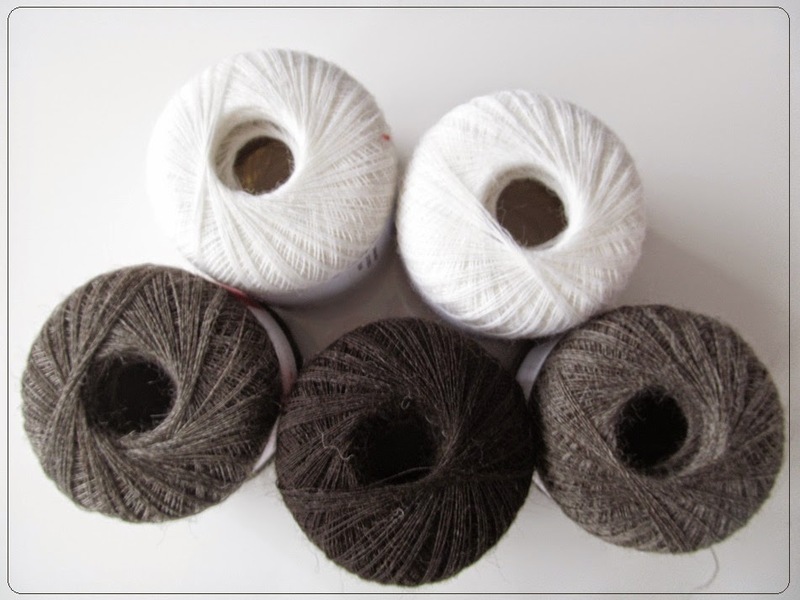 And because I had just had a spinning class, I decided to purchase some yarn in grey and spinning wool in white and 'black'. Let's see if I can do it..
De boeken die in de tas mee naar huis zaten. A legacy of Lace. Was 2 jaar geleden nieuw uitgekomen bij de 3e WoolWeek en toen niet gekocht. Nu toch blij er mee omdat ik nu ook een paar van de ontwerpsters heb leren kennen. Ik kreeg het kadoo van mijn mede reizigsters op mijn verjaardag. Dank je wel allemaal! The Shetland Trader: Book Two: Een prachtig boekje met sfeervolle foto's gemaakt in Belmont House op Unst. 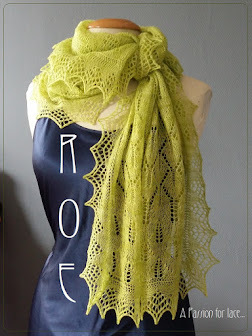 (ook verkrijgbaar via Ravelry). *Opletten: de patronen die op de cover staan, staan NIET in dit boekje. 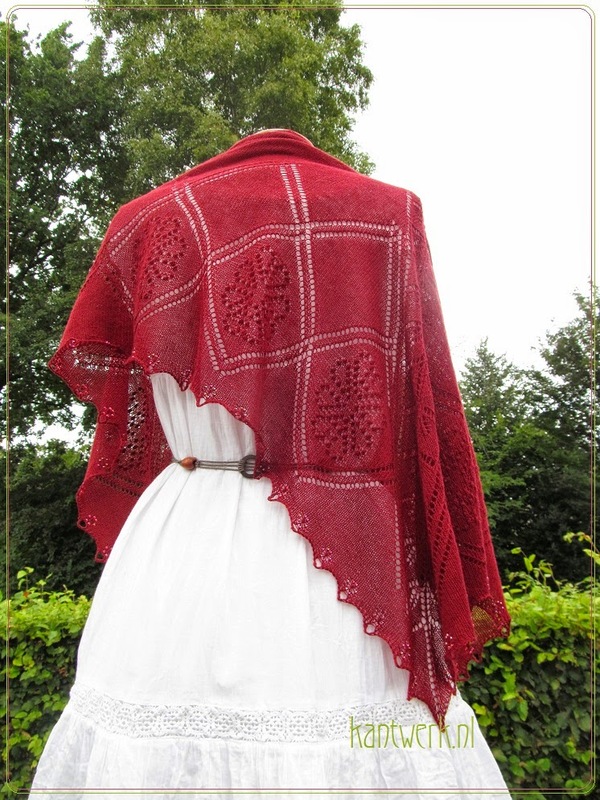 Ook staat er niet een kant en klaar patroon in voor een shawl; alleen losse patronen. 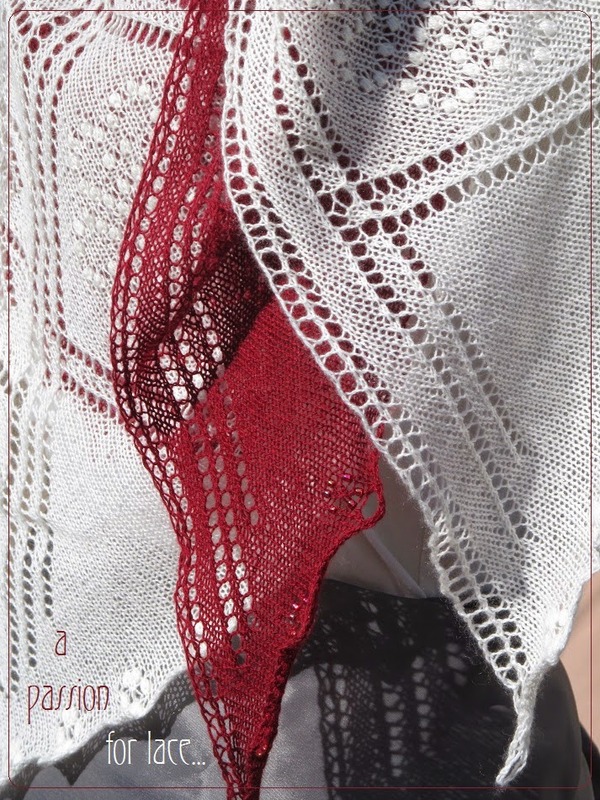 Het volledige patroon van de shawl is los verkrijgbaar. Ik denk dat je een mail moet sturen om het aan te vragen. 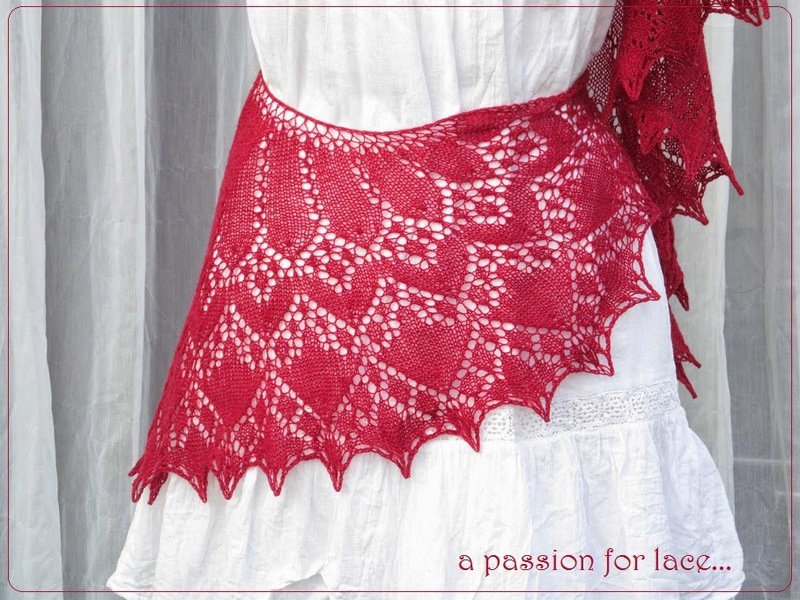 A Legacy of Lace: out 2 years ago during WoolWeek. Didn't buy it then, but I've come to know some of the designers and well, who can resist it anyway. Shade Card: Noticed it 2 years ago, but with a little more knowledge now, bought it. My friends got me this for my birthday: Thank you all! 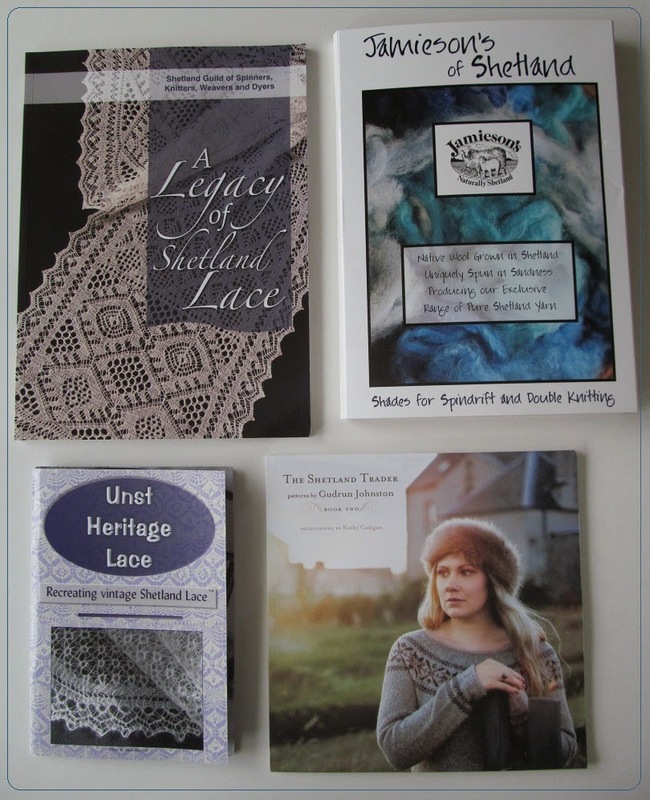 The Shetland Trader: Book Two: a very stylish book with pretty patterns of sweaters, cardi's and tops. 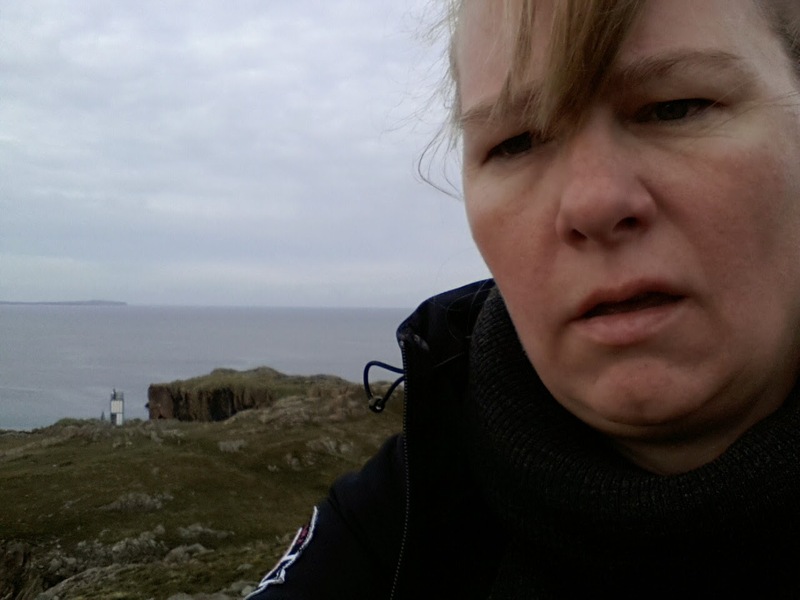 (and a hat) Foto's gemaakt op Belmont House op Unst. *Please notice this: the patterns that are on the cover ARE NOT in the booklet. 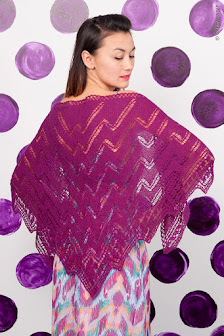 This only contains separate patterns to which you can build your own shawl. Full pattern available separately. I think you need to mail and ask for it. Als afsluiter toch ook nog een paar bolletjes Spindrift gekocht. Het lukt vast wel om daar ook nog wat moois mee te maken. To conclude: a couple of Spindrift balls. I'm sure I figure out something to make with these. 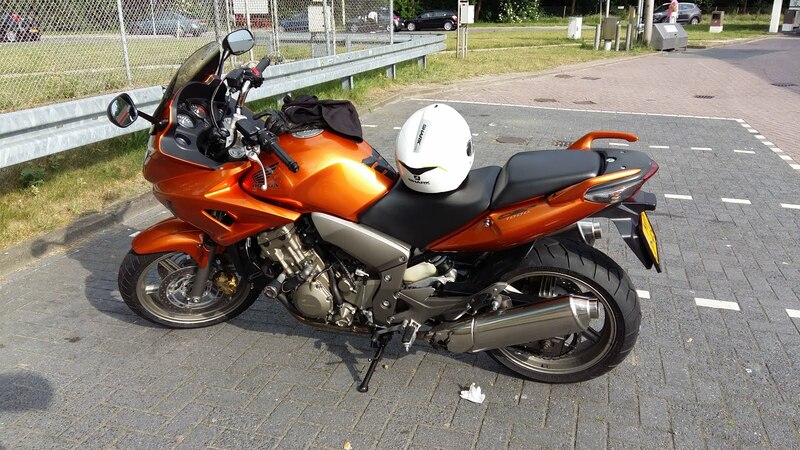 Ik ben effe weg! Ik vind het allemaal verschrikkelijk spannend: vliegen, varen! en allerlei geweldige mensen die mee gaan, die we daar gaan zien en ... natuurlijk het eiland zelf. Ik heb gewoon heimwee gehad na de eerste keer.... Deze keer verwacht ik niet dat het anders word. I'll be gone for a little while. I find it all to be terribly exciting: flying, boattrip and meeting / joining all sorts of great people and... ofcourse... the island itself. 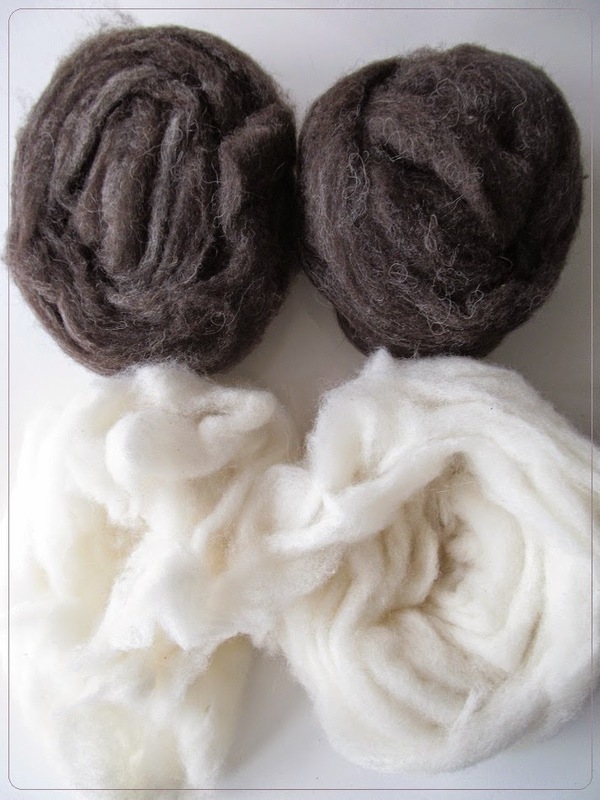 Ik ben er volgende week weer (de 13e...) en waarschijnlijk kan ik dan voor een hele tijd maar over 1 ding praten: Shetland Wool Week! 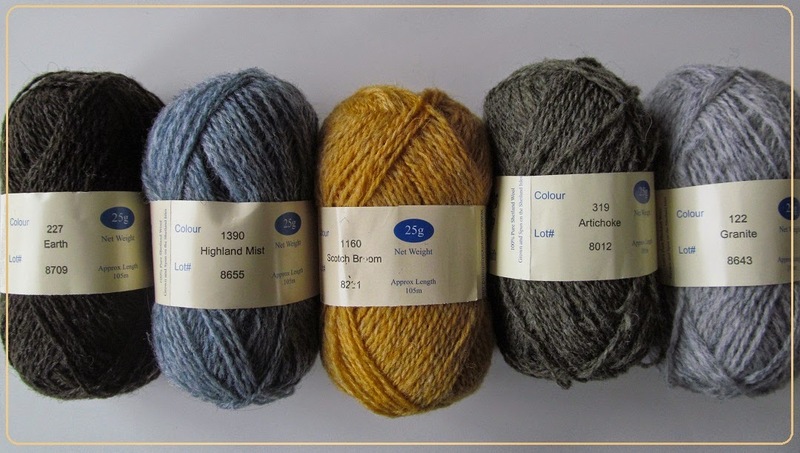 I'll be back on the 13th and probably only able to talk about one thing: Shetland Wool Week! To be clear.... / Om duidelijk te zijn. Er is een tijdje geleden een vraag gekomen of ik het patroon wilde schrijven van Diamonds are Forever. Net op een moment dat ik er eigenlijk zelf heel erg zin in had om met wat nieuws te beginnen. Het was een mooi tijdje geleden dat ik die voor het eerst had gebreid dus het voelde weer helemaal nieuw. A while back I recieved a request to write a pattern for Diamonds Are Forever. Just in time, I was thinking what to do next and this pattern was made just far enough in the past to make it feel like new. Een oproep voor testbreisters was gemaakt en ik mocht me wéér gelukkig prijzen met heel veel belangstelling. Het patroon is geschreven, besproken en in diverse hele mooie uitvoeringen tot leven gekomen. Ik heb zelf een rode gebreid met nupps voor de harten en kraaltjes in de rand. Lucy koos er voor om alleen maar kraaltjes te gebruiken (ipv nupps) en het origineel was met alleen maar nupps. I called for some testknitters and plenty were found. I'm really lucky with those people. 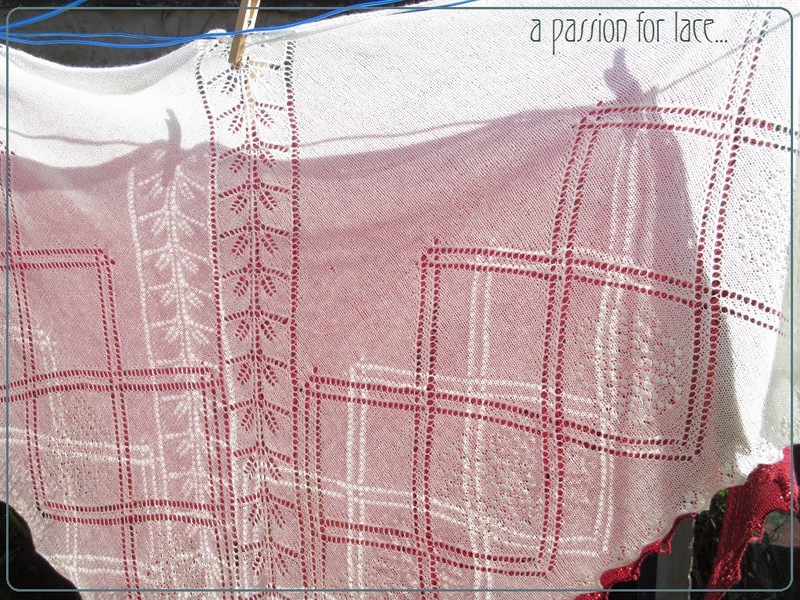 Pattern got written, discussed and executed in various yarns and colours. Lucy used all beads, I used nupps for the hearts and beads for the edging. The first one I made was white (all nupps) and the second was red. 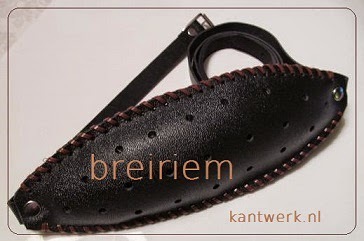 Best trots dat er zulke mooie resultaten worden behaald! Dank aan testbreisters: Lucy, Carmen, Hilda, Loltje, Florence en speciale dank aan Jolanda. Very proud with the results! Thank you testknitters: Lucy, Carmen, Hilda, Loltje, Florence and special thanks to Jolanda. Er is alleen 1 klein 'dingetje' wat me van het hart moet. 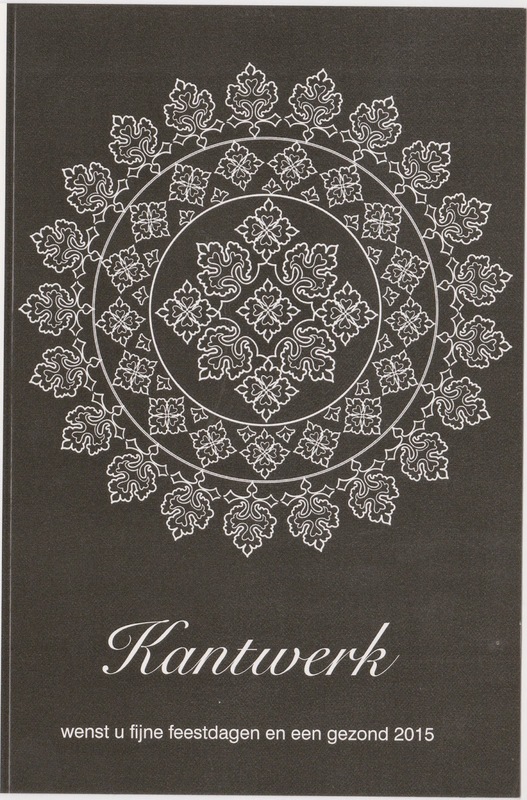 Mocht je nu al een shawl van Kantwerk hebben gemaakt, of 2... en je wilt er 1 verkopen, dan vind ik dat niet erg. Er staat DUIDELIJK op elke patroon pagina: niet voor commerciële doeleinden. Graag wil ik dat wel even weten, dan kan ik het in de gaten houden. Nu stond er onlangs 2 Muness Tower's op Facebook "Te Koop". Kijk, DAT kan dus niet. Ik heb zelf ook mijn geld verdiend door van een ontwerp maar 1 te breien. Het moet echter geen lopende band werk worden. Het moet niet zo zijn dat er volgende week een groene hangt en die week erna een roze etc. Dat kan ik niet waarderen. Ik hoop dat je het begrijpt. One little thing is bothering me though. 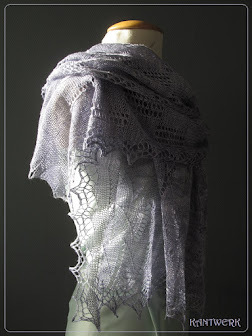 When you've made one shawl designed by A Passion for Lace, or two... and you want to sell one. I understand. On EACH pattern page is a footnote: not for any commercial purpose. Please let me know if you're planning on it, I'd like to know. The other day there were 2 Muness Tower's "For Sale" on Facebook. I have a BIG problem with that. I know I've made a living with selling knitted shawls but only by knitting ONE. It shouldn't become production work, this week a pink one and next week a green shawl. I DO NOT APPRECIATE THAT. I hope you understand. Also: if you prefer beads: 1149 beads size 8/0 and a 0,75mm crochet hook. How to make a nupp or add a bead is included in the 11 page pattern. ONLY charts, no written rows. 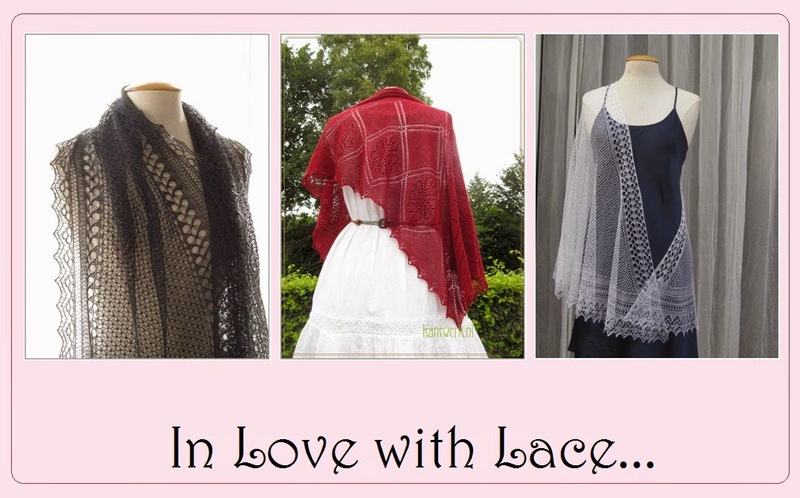 Also available in a pattern pack: in Love with Lace... 3 shawl designs with a lot of love. The 12th of Never (semi circular, starting with the edging). As ususal: Patterns are for sale on Ravelry, Etsy and Kantwerk.nl. Shawls can be purchased at Kantwerk.nl or my Etsy shop.